The Community Action Agency Butte County, Inc. (CAA) was pleased to announce that the Sustainable Futures Fund has contributed $30,000 to the CAA’s Camp Fire Disaster Relief Fund and another $30,000 to the CAA’s North State Food Bank (NSFB) for the coming year. NSFB collects and distributes healthy food to thousands of food insecure families throughout their North State service area that includes Butte, Glenn, Colusa, Plumas, Sierra and Tehama counties. With the help of our extensive network of community partners, the North State Food Bank offers multiple ways to help low income families get the food and nutrition they need. Following the Camp Fire, our North State Food Bank added Camp Fire food relief efforts called Tailgates to distribute free boxes of healthy food to any one in need. 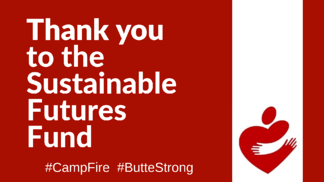 Our Camp Fire Disaster Relief Fund was created to assist with the multiple phases of emergency support and recovery that Butte County will face in the coming years of rebuilding from the Camp Fire. Phase 1 of this assistance was in the form of support with hotel/ motel payments and emergency food for those evacuees staying in the area. Phase 2 of the assistance will include housing assistance for evacuees, including those who desire to relocate to other areas. In addition, food assistance is continued because the need impacts both survivors and those who continue to extend a helping hand. These donations will go to further help our community in the wake of the most devastating fire in California history. Since 1967, the Community Action Agency of Butte County Agency has worked to provide hope to people struggling with poverty and to help them become more economically secure by meeting tangible needs in the areas of energy efficiency, affordable food and housing. Programs include: Energy and Environmental Services; North State Food Bank; and our Esplanade House. For more information, visit www.buttecaa.com. Were You Affected by the Camp Fire? The official website for Camp Fire response and recovery is buttecountyrecovers.org. You will find helpful information and resources to help with your recovery process. Everything from mental health to debris removal information can be found on this site. You will also find a helpful FAQ section that addresses common questions.